Upgrade your home décor effectively and efficiently with our ceramic tile flooring. Floors have a significant impact on a home’s overall atmosphere and appearance. Depending on the flooring you install in your kitchen or bathrooms, you could dramatically change the style and perception of your home. Trust our flooring specialists to help you choose a flooring product that adds to your home's value and comfort. We have the top brands from Emser, Interceramic, and Marrazzi. Make a lasting statement at home with stylish and durable ceramic tile. Our locally trusted store carries an extensive selection of elegant flooring suitable for households of every size. Many of our ceramic floor tiles are perfect for families looking for a fast and affordable way to make an emphasis in any room in need of an upgrade, including kitchens and bathrooms. Tile is easy to clean and maintain. All of the ceramic tile products we carry are capable of withstanding traffic in even the most active households. Additionally, it's easy to expand your design horizons by choosing from our wide assortment of colors and textures. Enjoy our exclusively low prices when you're ready to remake your kitchen or bathroom with a flooring product from our ceramic tile shop. 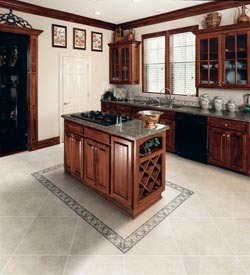 Add classic style and value to your flooring with ceramic tile flooring. Ceramic products offer a number of unique benefits. Durable, easy to clean, and available in numerous colors, patterns, and sizes, it is a cost-effective tool for many homeowners. Increase the value of your home while adding an easy-to-install and repair flooring option. Ceramic floors are popular in many home and business properties due to their unique features. Tile is a highly durable material that can withstand a great deal of wear and tear from heavy foot traffic. Cover the floors of your kitchen and bathroom with this material and discover the difference it can make in your cleaning routine - tile is highly resistant to water, stains, dents, and fading. With so many ceramic floor tiles to choose from, you never have to limit yourself to rejuvenating your floors. You are sure to find the ideal choice that best fits your needs in looks, performance, and price. Our ceramic tile products can even be mounted on your walls to make eye-catching backsplashes. In addition, tile can be used to create unique patterns and pictures, making it the perfect element for homeowners looking to add visual appeal to their kitchens and bathrooms. Count on ceramic tile to add appeal and tremendous resale value to your home. With the design flexibility ceramic tiles offer, you can be sure you receive the flooring that best suits your needs in terms of looks, performance, and price. A tile floor made of ceramic is a fitting foundation for an entirely new approach to interior design. This material adds an enduring and timeless elegance to any space. Any room with ceramic tile floors is immediately upgraded with a “wow” factor. Make a lasting statement and make your home a showplace with these floors. Our flooring specialists offer you the perfect way to restore the vitality and value to your home and make it look as good as new. A new floor is an investment worth making for homeowners that care about the long-term resell values and appearances of their homes. That's why it makes sense to recruit skilled contractors when you need new ceramic tiles installed in your kitchen or bathroom. Only an experience professional can ensure your tiles are handled and laid with the utmost care and precision. Turn to our flooring store when you're ready to schedule ceramic tile installation. We'll dispatch a team that understands the importance of handling your latest investments with the respect they deserve. We know that tile must be perfectly installed - that's why we bring all the tools and equipment we need to ensure you're completely satisfied with your new flooring or backsplash additions. Additionally our unique Beautiful Guarantee enables you to feel good the work we do in your home. Thanks to this guarantee, it's easy for you and your family to relax as we install your new ceramic tile flooring. That's because we reinstall any flooring products you don't absolutely love. If you're not satisfied with our work, we'll revise it - free. Be sure to request a free estimate based on your flooring or backsplash goals before you purchase materials. An estimate can help you glean more insight into your options, and when it comes to our tile selections, it's important to measure twice and cut once. Let us help you make a wise decision. Contact us to request a free estimate on our ceramic tile installation services. We proudly serve the communities of Okemos, East Lansing, Holt, Haslett, and Lansing, Michigan, plus the surrounding areas.